Formed in 1904 to keep mariners’ children out of mischief, the Royal Naval Volunteer Cadet Corps has become a flourishing youth organisation in the Portsmouth area. The RNVCC, along with the RMVCC, is part of the Volunteer Cadet Corps and is therefore sponsored and fully supported by the Royal Navy. Said to have originated with a bored lad with questionable football skills, the VCC was created to give the lad, and his friends, an alternative and more constructive way of passing the time. The formation of the RNVCC was very much based upon the successful unit already established by the Royal Marines Artillery in Eastney. As the Royal Navy estate decreased over the latter 20th Century so did the RNVCC, although today it boasts active and growing units in HMS Collingwood, HMS Excellent and HMS Sultan. Originally only open to boys of serving sailors, the RNVCC was aligned with the Royal Marines Artillery and Royal Marines Light Infantry Cadet Corps as the Volunteer Cadet Corps, and was subsequently open to boys from all three services and then to boys and girls from each establishment’s local civilian community. 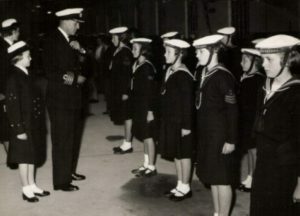 Unlike the Sea Cadet Corps, who obtained Admiralty recognition in 1919, the RNVCC has always been ‘part of the Royal Navy’ and whilst having the same general aims as the SCC has been supported and managed by the Naval Service in a different way usually with larger number of cadets in each unit, thus retaining its own identity and command.